You want the children in your life to be safe, so you teach them to look both ways before they cross the street and to buckle up in the car. 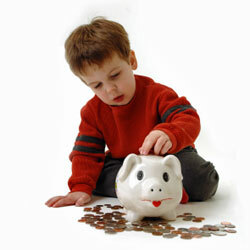 But you also can help them to be financially safe, by teaching them how to develop a saving habit. And that might not be as hard as you think. The key, according to AOL Money, is to be clear and consistent in delivering your message about the importance of saving. Of course, you need to tailor your talk to the age of the children. But whatever their age, you should make clear that it is important to save some money in case of unexpected expenses and also to fund the future, and that saving money for the future usually involves giving up something in the present. Be a good example. Let your children or grandchildren see you saving, even if it is only a little. When you decide against buying something, simply explain that it does not fit into your budget because you want to put that money into your savings. Be matter-of-fact, not preachy. But be clear that it is important to you to save for the future, and explain why. Do what you say. Your speeches about the importance of saving don’t ring true if the kids see you giving in to impulse buying. Instead, let them help you think of ways to save more. For example, have them go through the Sunday paper and clip coupons; have contests to see who can find the best coupons on items you regularly buy. As they get older, explain they can save automatically, either through accounts such as 401(k) accounts or through bank accounts that automatically deposit money into a savings account. Use technology. Kids love technology, so let them see that technology can be an important tool in saving. Use your tablet or smartphone to show how interest works. With older children, show them how to check the balance of a savings account online, and note that the balance grows over time. Match their saving. You know that a company match is a major incentive to save in a 401(k) plan. Well, you can provide the same kind of incentive to your children or grandchildren. Most experts suggest that you encourage children to divide money they receive – through an allowance, gifts or work – into money to spend now, money to save and money to donate to charity. Kids obviously get the advantage of spending money now, and many kids also can get very excited about donating to a charity they choose. But saving – whether they are saving for a specific major purchase or simply to have money in the bank – can be more difficult for children. So help them out by telling them that for every dollar they save, you will add something to their account; even a quarter or 50 cents is fine. Explain how that means that instead of having only $1, they will have $1.25 or $1.50 – or whatever you choose to match. And then remind them that if their account earns interest, it will grow even more. By helping children learn how to save, you will be giving them the tools they need to safeguard their financial futures.